This is not a fight to the death. This is a fight against death—the death of our democracy. Even if Donald Trump leaves the White House in shame and dishonor prior to the 2020 election, Trumpism will still be with us. Even though Roy Moore was defeated last Tuesday, Mooreism will still be with us. The forces of political backwardness and brutality still have tremendous power. Those forces still need to be resisted. The forces of good won a physical Civil War a century and a half ago. Now, the forces of good must win the new ideological Civil War against a conservative confederacy that does not want to make America great again, but remake America in its own dark image. We need your help to win this war. Your support provides the reinforcements needed to push back against the battalions of bigotry, and boost the morale of those fighting to ensure that truth emerges victorious on this new battlefield of ideas. 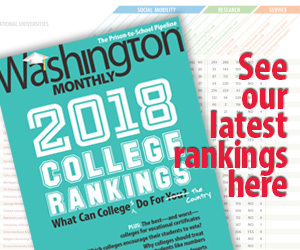 Please consider making a tax-deductible donation to the Washington Monthly today. Until December 31, your contribution will be matched by will be matched by Democracy Fund and by the Knight and MacArthur Foundations, bolstering the strength of this army. Your help is our hope. Honesty, truth, justice and facts don’t triumph in this country, or in this world, without a fight. That fight is brutal, hard, vicious, but necessary, noble—and with your help, winnable. Your support is vital to our efforts. Your backing keeps us in this fight. Your commitment helps us continue the effort to make sure that America can be all that this country can be.